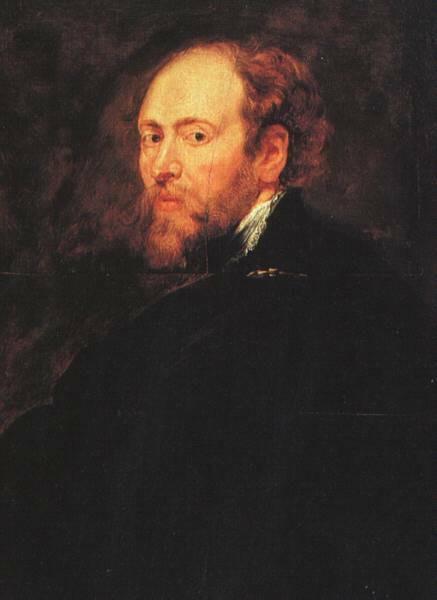 The Flemish baroque painter Peter Paul Rubens, b. June 28, 1577, d. May 30, 1640 was the most renowned northern European artist of his day, and is now widely recognized as one of the foremost painters in Western art history. 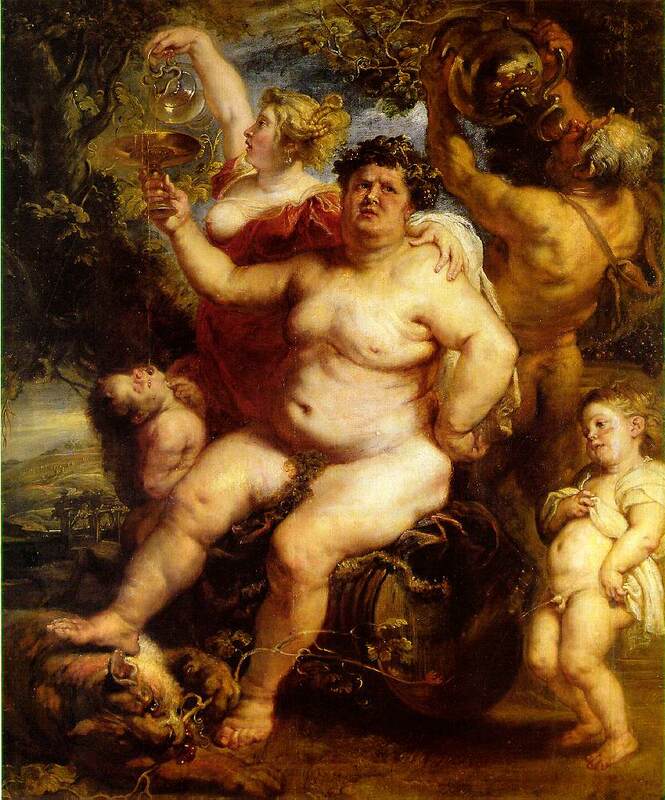 By completing the fusion of the realistic tradition of Flemish painting with the imaginative freedom and classical themes of Italian Renaissance painting, he fundamentally revitalized and redirected northern European painting. 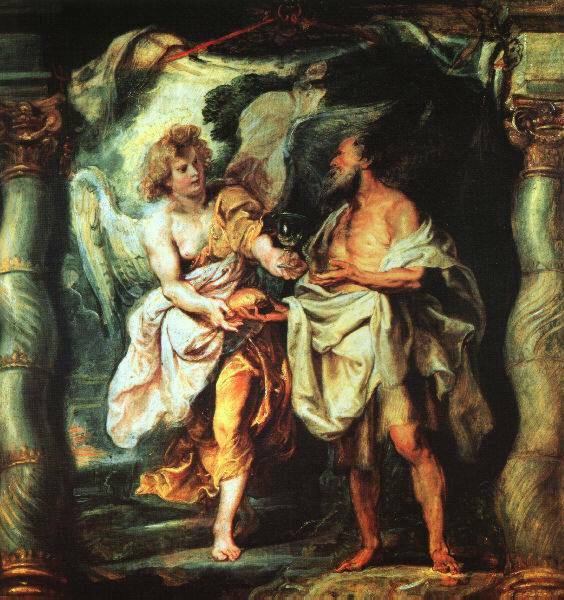 Rubens's upbringing mirrored the intense religious strife of his age--a fact that was to be of crucial importance in his artistic career. 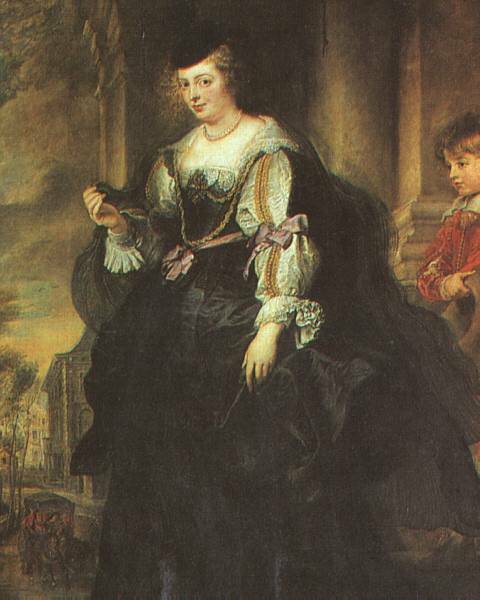 His father, an ardently Calvinist Antwerp lawyer, fled in 1568 to Germany to escape religious persecution, but after his death (1587) the family moved back to Antwerp, where Peter Paul was raised a Roman Catholic and received his early training as an artist and a courtier. By the age of 21 he was a master painter whose aesthetic and religious outlook led him to look to Italy as the place to complete his education. Upon arriving (1600) in Venice, he fell under the spell of the radiant color and majestic forms of Titian, whose work had a formative influence on Rubens's mature style. 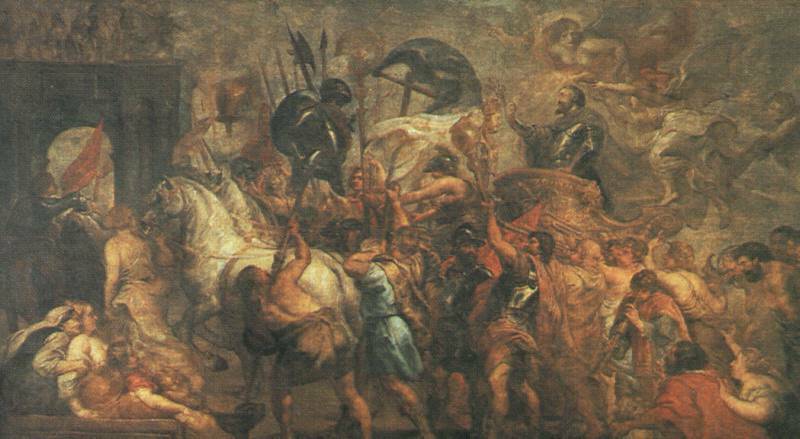 During Rubens's 8 years (1600-08) as court painter to the duke of Mantua, he assimilated the lessons of the other Italian Renaissance masters and made (1603) a journey to Spain that had a profound impact on the development of Spanish baroque art. He also spent a considerable amount of time in Rome, where he painted altarpieces for the churches of Santa Croce di Gerusalemme (1602; now in Hopital du Petit-Paris, Grasse, France) and the Chiesa Nuova (1607; now in Musee de Peinture et Sculpture, Grenoble, France), his first widely acknowledged masterpieces. 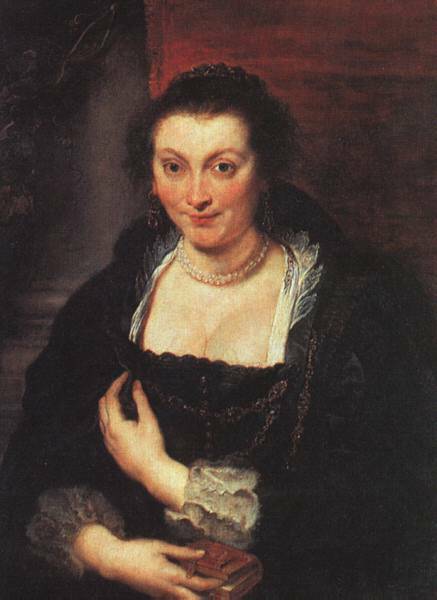 His reputation established, Rubens returned (1608) to Antwerp following the death of his mother and quickly became the dominant artistic figure in the Spanish Netherlands. 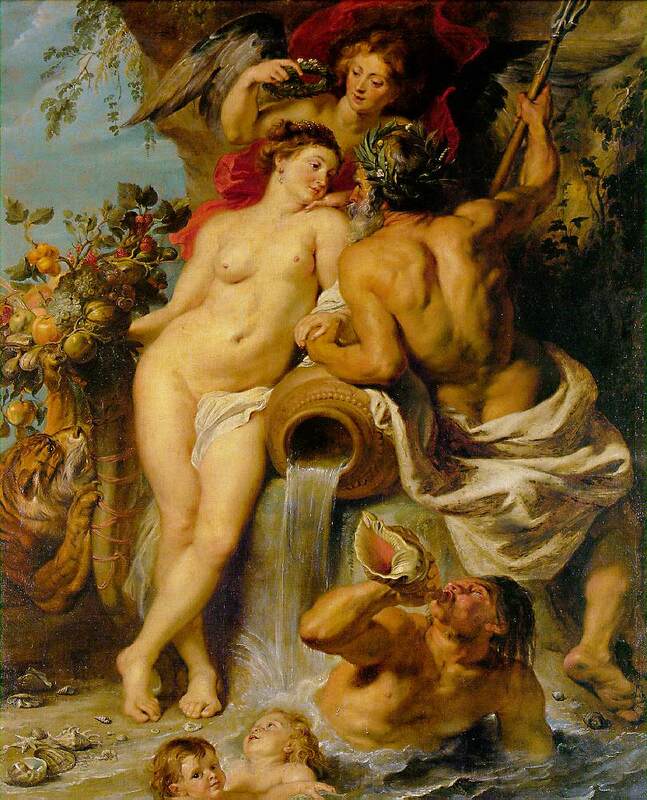 In the mature phase of his career, Rubens either executed personally or supervised the execution of an enormous body of works that spanned all areas of painting and drawing. 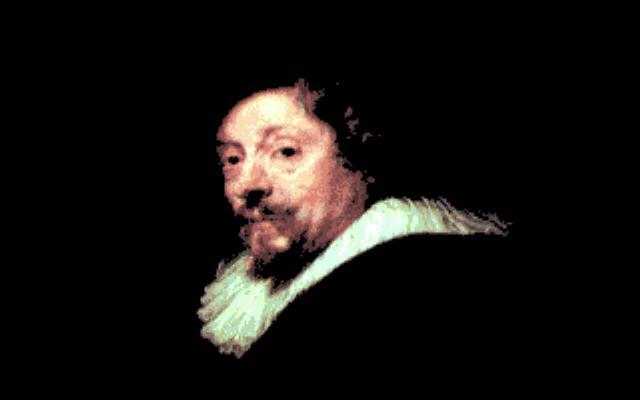 A devout Roman Catholic, he imbued his many religious paintings with the emotional tenor of the Counter-Reformation. 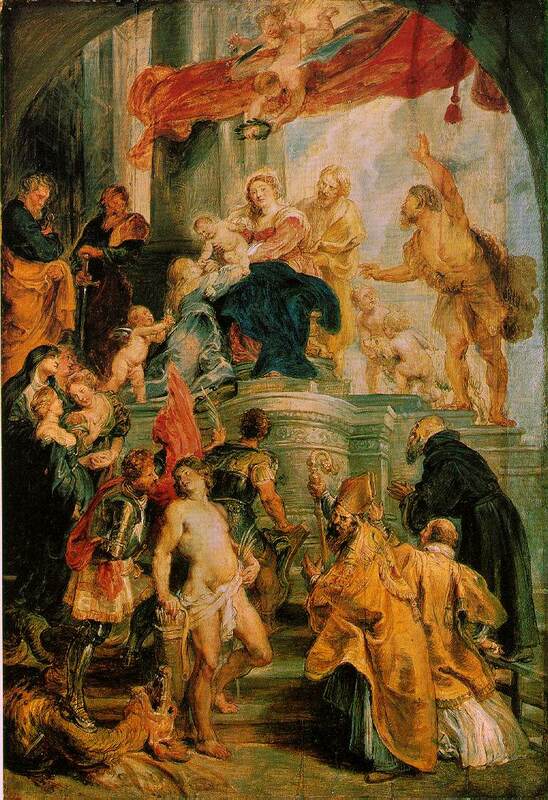 This aggressively religious stance, along with his deep involvement in public affairs, lent Rubens's work a conservative and public cast that contrasts sharply with the more private and secular paintings of his great Dutch contemporary, Rembrandt. 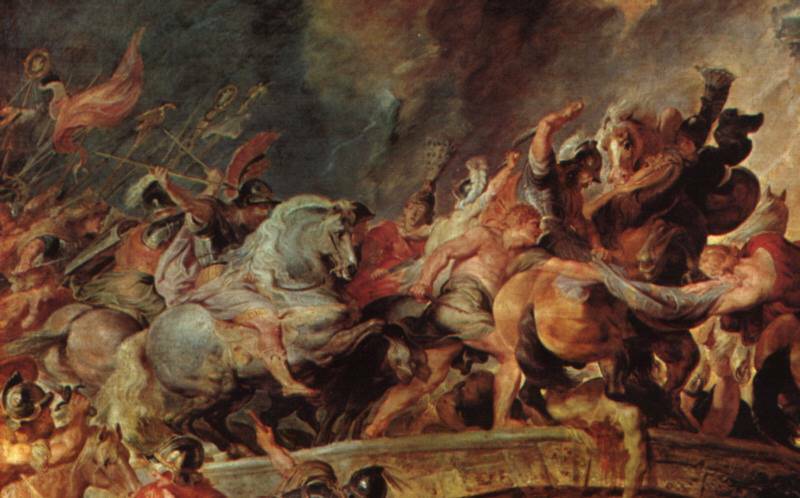 But if his roots lay in Italian classical art and in Roman Catholic dogma, Rubens avoided sterile repetition of academic forms by injecting into his works a lusty exuberance and almost frenetic energy. Glowing color and light that flickers across limbs and draperies infuse spiraling compositions such as The Descent from the Cross (1611; Antwerp Cathedral) with a characteristically baroque sense of movement and tactile strength. A love of monumental forms and dynamic effects is most readily apparent in the vast decorative schemes he executed in the 1620s, including the famous 21-painting cycle (1622-25; Louvre, Paris), chronicling the life of Marie de Medicis, originally painted for the Luxembourg Palace. 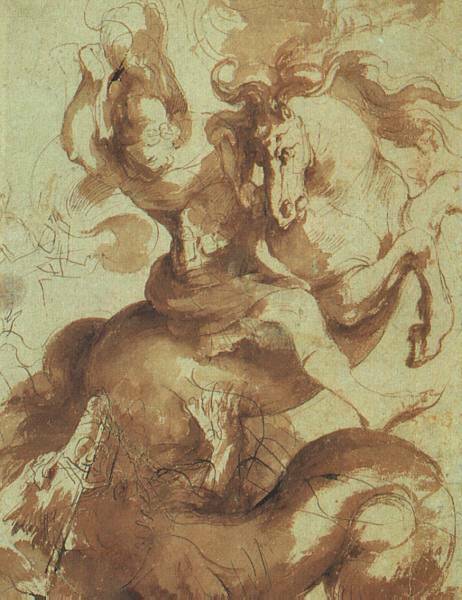 In order to complete these huge commissions, Rubens set up a studio along the lines of Italian painters' workshops, in which fully qualified artists executed paintings from the master's sketches. 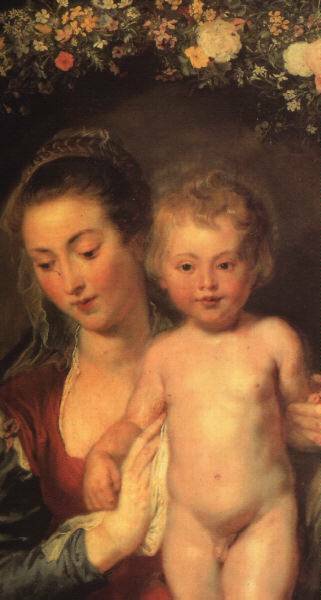 Rubens's personal contribution to the over 2,000 works produced by this studio varied considerably from work to work. 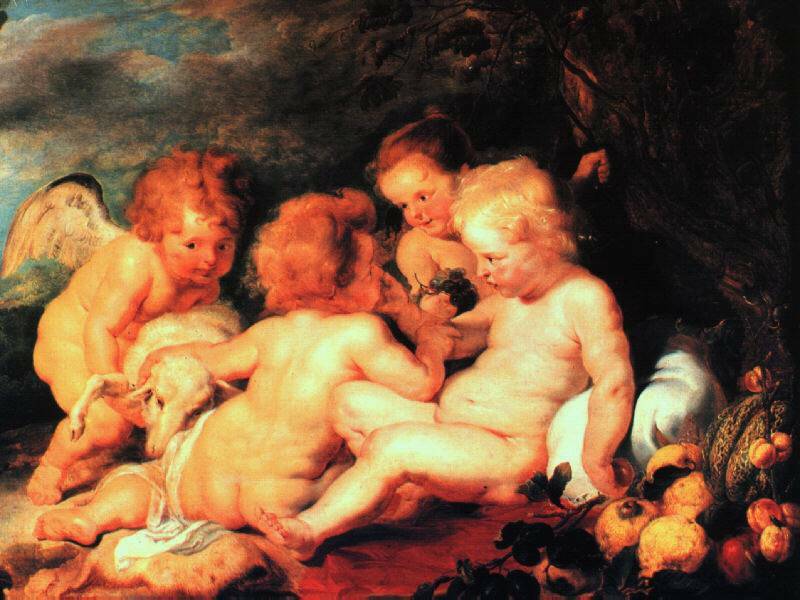 Among his most famous assistants were Anthony van Dyck and Frans SNYDERS. 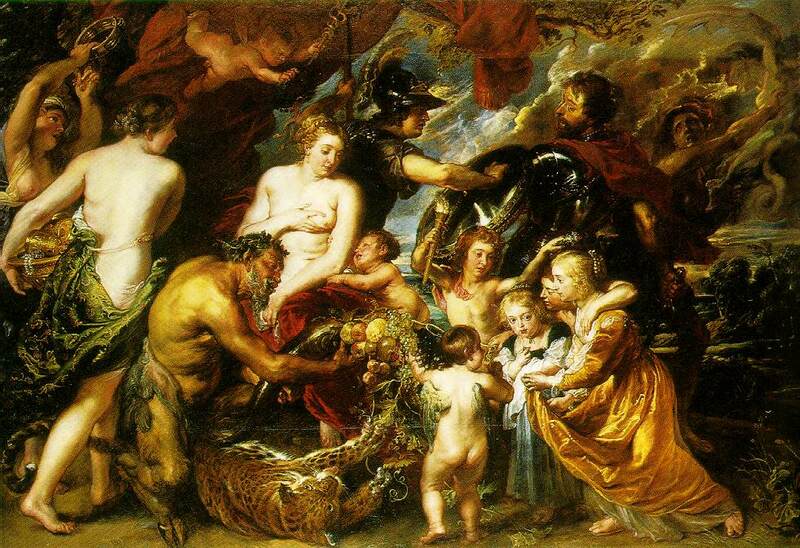 Rubens's phenomenal productivity was interrupted from time to time by diplomatic duties given him by his royal patrons, Archduke Ferdinand and Archduchess Isabella, for whom he conducted (1625) negotiations aimed at ending the war between the Spanish Netherlands and the Dutch Republic and helped conclude (1629-30) a peace treaty between England and Spain. 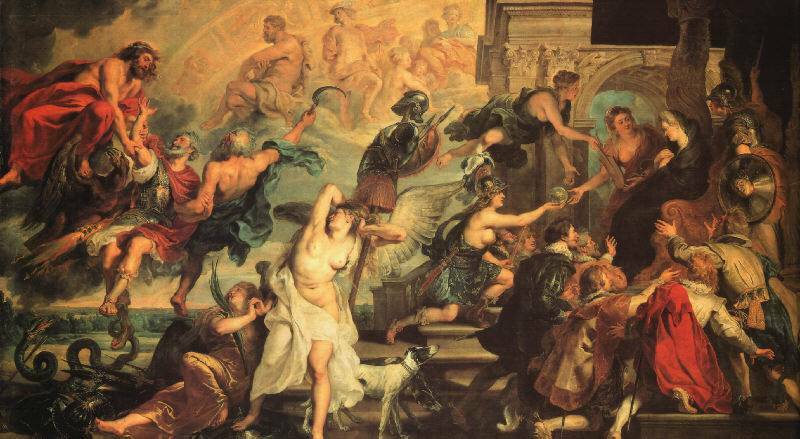 Charles I of England was so impressed with Rubens's efforts that he knighted the Flemish painter and commissioned his only surviving ceiling painting, The Allegory of War and Peace (1629; Banqueting House, Whitehall Palace, London). 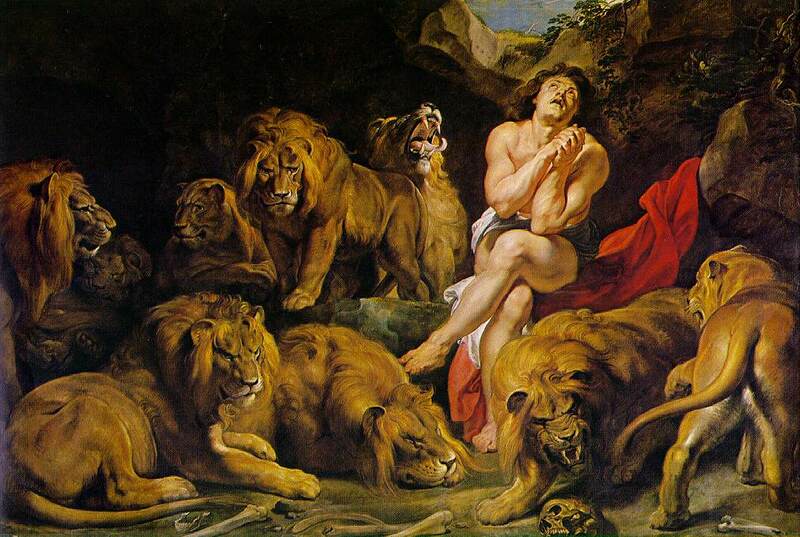 During the final decade of his life, Rubens turned more and more to portraits, genre scenes, and landscapes. These later works, such as Landscape with the Chateau of Steen (1636; National Gallery, London), lack the turbulent drama of his earlier paintings but reflect a masterful command of detail and an unflagging technical skill. 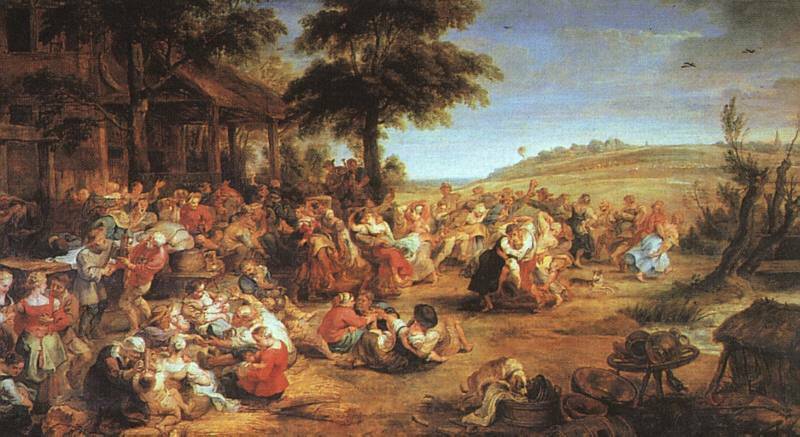 Despite recurring attacks of arthritis, he remained an unusually prolific artist throughout his last years, which were spent largely at his estate, Chateau de Steen.